She heard a gasp behind her, and she turned to look. Nothing. 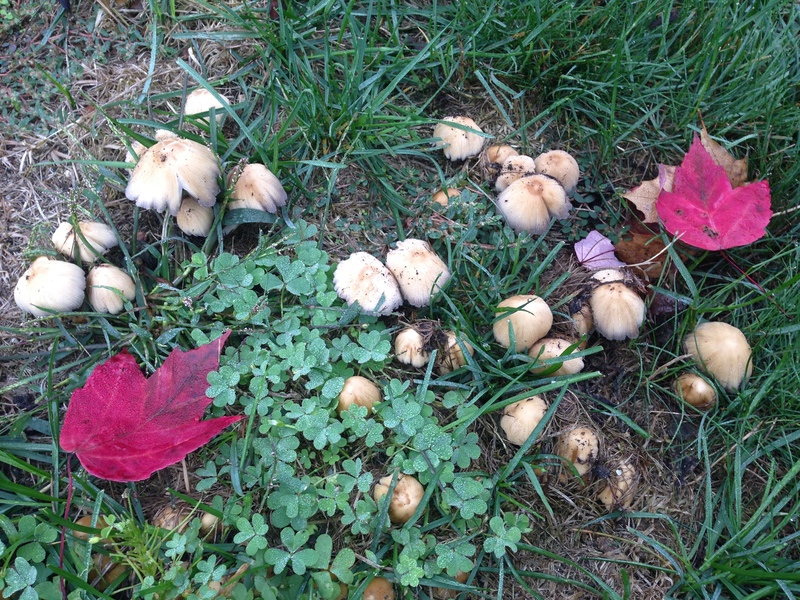 Except, beside the clover patch, was now a toadstool circle. All the toadstools looked down, as if not wanting to draw attention to themselves. They seemed to be hiding. “Those weren’t there a minute ago.” Jane said out loud. Brian walked toward her on the sidewalk. “Look, mushrooms,” he said. He reached down to pick one. “Leave them alone!” Jane called. It almost looked as though the toadstools shank away from his hand. She shook her head. Surely she was being fanciful. “Why?” Brian’s green eyes looked curious rather than irritated. She vaguely remembered Brig Bicker-Backer having blue eyes. “They are part of my science experiment,” Jane invented wildly. Brian looked dubious, but he stood up. Jane was not sure why, but she felt protective of the toadstools. “Oh, no! He’s getting so fat! Your mom promised my dad not to feed him again.” Jane spared a glance at the toadstools, and they seemed relaxed again. One appeared to be looking up at her. As she walked past, she could have sworn she heard a sigh. She scooped up Mr. Puffy and carried him inside her house through her back door. When she looked out her front window, she could see the clover, but the toadstools were gone. “Dad, I saw some toadstools,” Jane started. “Toadstools?” Jane told her father all about the disappearing toadstools. “Probably migrating wood elves.” Jane’s mouth dropped open at her father’s theory. “You surprised them, and they didn’t have time to run. Haven’t you ever noticed how mushrooms can be there one minute and gone the next? Suspicious behavior.” Her father wandered back into his study, muttering under his breath about neighbors, fat cats and surly vets. Jane thought back to the gasp and sigh she had heard. She went back outside and stared at the two red leaves and the clover, not a mushroom in sight. Could they have been migrating wood elves? 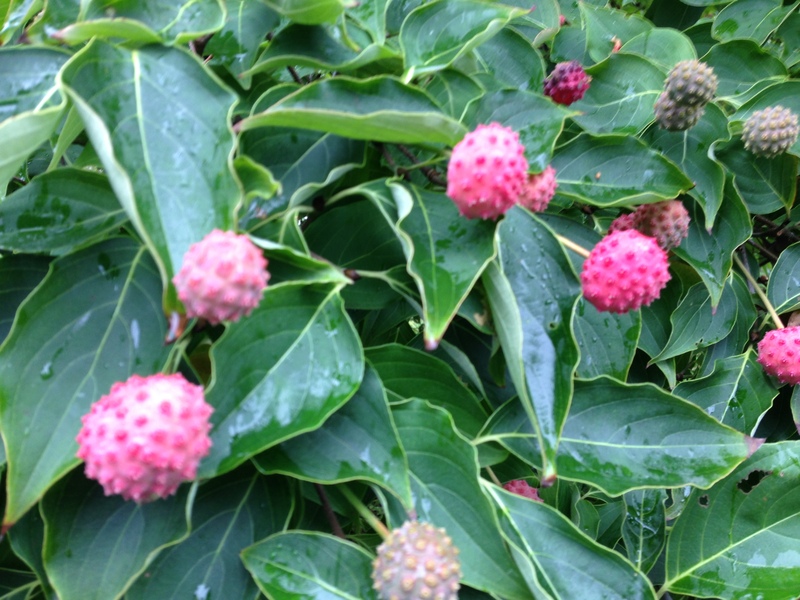 She thought she heard a giggle from the dogwood, but all she could see were dangling red fruit.“Jane, dear, want a brownie?” Mrs. Bicker-Backer called through her screen door. “Sure,” Jane answered. Through the door of the Bicker-Backer’s house she went, but that adventure will have to be told another day. I always smile when I visit. I enjoyed your story and you haiku. I think you would also enjoy haibun. This was enchanting, I liked its playfulness and Dad’s “theory,” too! I’m so happy you liked it. 🙂 Thanks again for commenting. Beautiful story Brenda, you’re a great writer, congratulations!! 🙂 I’m sure young girls prefer brownies! 🙂 Thanks for commenting! I believe you are this century’s Beatrix Potter… I’m not kidding! This is so cute, Brenda…well done! !